New Greens | Green Superfood Powder | 54 Active Antioxidant Ingredients | Juice & Smoothie Drink with Herbal, Enzyme & Fiber Blends | Berry Flavor | Non-GMO, Vegan & Gluten Free. Our New Greens Berry formula boasts 54 individual antioxidants, enzymes and key botanical ingredients. The focus for this product is the herbal superfood blend, designed to provide the body with an unprecedented antioxidant punch and adaptogenic herbs known to increase stamina and physical energy. Standout antioxidants in this blend hail from exotic locales around the world and include Açaí berry, Goji berry, Mangosteen, and Noni fruit. Like our other green drink blends, New Greens Berry flavor has been exclusively formulated by Dr. Chad Larson to address the antioxidant power of increased fruit and vegetable intake. These are perhaps the two things that matter most to most! We understand that most people simply can't choke down green drinks that resemble clumpy pond scum. So, our goal was to make a very comprehensive high-antioxidant formula that actually tastes really good! Along with fiber and healing enzymes to help detoxify the body, New Greens Berry is a complete daily superfood providing some of the best of what nature has to offer. 54 ACTIVE NUTRIENT BOOST with 3X more powerful than the leading "Super food" brands! Every scoop has over 54 individual antioxidants, enzymes and key botanical ingredients. 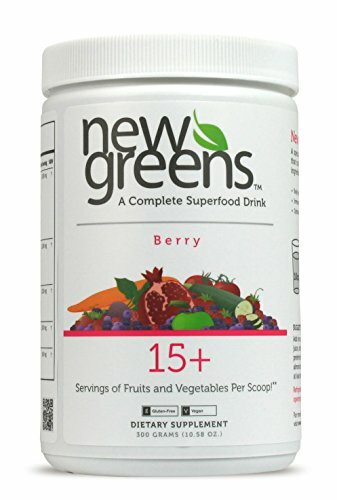 NewGreens Berry is an herbal greenfood powder supplement designed to provide the body with an unprecedented antioxidant vitamin punch and adaptogenic herbs known to increase stamina and physical energy also containing fiber and healing enzymes to help detoxify the body. DOCTOR FORMULATED & RECOMMENDED by Dr. Chad Larson, a Certified Clinical Nutritionist, developed NewGreens for those of us always on the run, not necessarily having the time to get our required amounts of fruits and veggies we need in order to maintain optimum energy, health and vitality. Dr. Chad Larson not only developed a very comprehensive high-antioxidant organic supergreens powder but also created green drink tastes really good and mixes really well. 15+ ANTIOXIDANT RICH FORMULA FOR OPTIMAL HEALTH, verified by an industry leading independent lab. New Greens whole food powder contains the antioxidant capacity of well over 15+ servings. Stand out antioxidants in this blend hail from exotic locales around the world and include Açaí berry, Goji berry, Mangosteen, & Noni fruit. Each one of these exotic antioxidants may help with promoting weight loss, provide anti-aging health benefits, immune function support, and cardiovascular health support. INDEPENDENTLY CERTIFIED INGREDIENTS for their quality and purity. NewGreens products are hypo-allergenic and vegetarian. There are absolutely no added fillers, artificial flavors, artificial sweeteners, artificial colors, artificial preservatives, hydrogenated oils or excipients. All of our NewGreens products feature non-gmo and organic grown whole food fruit, vegetable dehydrated juices, and herbal extracts. HEALTHY ENERGY BOOST that naturally gets you through your day. NewGreens Berry includes an Energizing Herbal Blend, which uses traditional herbs and extracts to enhance stamina and energy. Best of all, you get the energy boost without the jitters of caffeine. If you have any questions about this product by New Greens, contact us by completing and submitting the form below. If you are looking for a specif part number, please include it with your message.